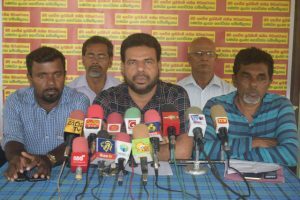 The hearts of the farmer community, as well as the general public, are bleeding due to the policy followed by the government at a time when the Sinhalese and Tamil New Year is about to dawn says the National Organizer of the all Ceylon Farmers’ Federation Namal Karunaratna. Speaking at a press conference held at Dambulla yesterday (12th) Mr Karunaratna said the government, instead of providing relief to the farmer community, has got indebted to the farmer community and pointed out that Rs. 7.5 million has to be paid for the upcountry potato farmers for the stocks of potatoes bought from them and millions have to be paid for big onion farmers as well as seed producers in Dambulla. The promised Rs.40,000 cultivation damage compensation has not been paid fairly to the affected farmers and the cultivations that were harmed by the Fall Armyworm (Sena caterpillar) have not been compensated though compensation has been recommended for fake farmers pointed out the National Organizer of the All Ceylon Farmers’ Federation. He said despite insurance premium has been collected no compensation has been paid and even eh farmers’ pension is paid after deducting Rs.50 from each complained Mr Karunaratna and added the pensionable age has been increased from 60 years to 63 years. He said the government is so bankrupt that Rs. 100 from social assistance paid to the poverty-stricken and Rs.200 from Samurdhi relief are deducted to collect by government coffers. However, government ministers get more and more privileges and increase their allowances. He said certain ministers and Parliamentarians go abroad to spend the New year spending public money. He pointed out councillors of local government councils too get their allowances increased and asked the water management committee of Moragahakanda reservoir to withdraw the decision taken not to make available water for agricultural purposes. The Vice- President of all Ceylon Farmers’ Federation Susantha Kumara Navaratna, its General Secretary T.B. Sarath also addressed the press conference.